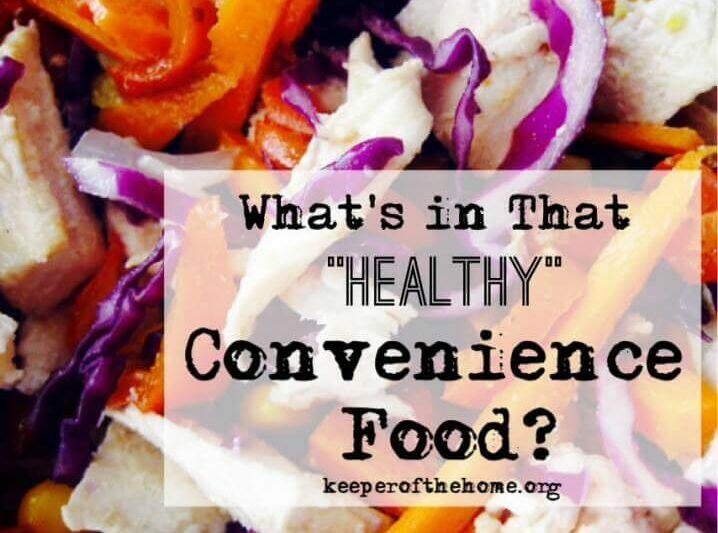 You are here: Home » Blog » Natural Living » What’s in That “Healthy” Convenience Food? Whether you’re traveling, eating out with a friend, or picking up some convenience food for lunch boxes, do you know if you’ve made a healthy choice? At first glance, many meal options appear healthy, but some added ingredients may be a surprise. Convenience food or restaurant developers have deliberately designed scientifically-adjusted fast food flavors and textures of their foods to appeal to customers and to remain memorable and desirable. Fast food restaurants and packaged food companies typically serve foods which have been processed to offer irresistible flavors and easy-to-eat textures. From salty-sweet chicken dinners and frosted cinnamon buns, to vegetable oil-laden dressings and syrupy iced drinks, menu items are full of ingredients that trigger emotional and mental responses to the pleasure of taste. Fast food restaurants’ offerings are intentionally designed to appeal to cravings for certain flavors, aromas and textures, instead of merely satisfying hunger or providing nourishment. “Food companies make these foods with very large amounts of three ingredients- sugar, fat and salt… These three ingredients, when put together in the right amounts, make us eat more… Instead of satisfying our hunger, these foods train our bodies and our brains to want more. And food companies, including fast food chains, understand this very well. They are hard at work to make new foods that will get us to keep eating” (7). Fast food processors use scientific techniques and ingredients to produce signature menu items when they create the ingredients which are later delivered to restaurant kitchens. For example, consider a chicken salad from a typical restaurant menu. When initially previewing the menu, it seems to stand out as a healthy option amid the fried foods. However, grilled meats are often presoaked or injected with sugar and salt-filled sauces and chemical flavorings, which increase the flavor intensity compared to a typical meal at home. Later, when the processed food is served to a patron, the food is usually accompanied by sweet sauces made mostly of sugar substances such as high fructose corn syrup. In Your Food is Fooling You, Dr. Kessler explains that processors for fast food restaurants may “inject sauces into meats with hundreds of needles. This tears the meat, basically making it ‘prechewed'” (64). Sara Ward, researcher at University of North Carolina at Chapel Hill explains that “the power of sugar and fat was only slightly less than cocaine, a highly addictive drug… [and] when a food is almost as powerful as cocaine, we know it is highly reinforcing” (Kessler 40). Fast foods with addicting flavors and a pleasing, soft texture encourage customers to quickly and easily eat more, and then crave it as “comfort food” later. Many convenience foods will bear healthy-looking wrappers with nature themes, gluten-free labels or diet claims. However, inspecting the ingredient list may reveal not just sugar, but multiple forms of sweetener in a single item! Evaporated cane juice, honey, brown rice syrup, glucose syrup, fructose, sucrose, corn syrup, tapioca syrup and more are often added to products in combinations. Consider whether the meat serving is in a likely “cut” or has it been processed and reformed into a dinosaur-shaped “nugget”. Is the meat served in uniform-sized and breaded or marinated fillets or strips? That “healthy” salad may come with not only injected or marinated meat, it may also be served with sugar-coated walnuts, a sweetened vegetable oil dressing and salty dips for your side dish. Snack foods are often available with “mix-ins” or dips that sneak sugar, unhealthy types of fats and excess salt into a child’s meal, transforming healthy yogurt or veggie sticks into a less-than suitable treat. Sometimes, meal options are very limited when you are on the road or at a family gathering, for example. Keeping an eye out for some of these sneaky convenience food “traps” can help you choose a preferable meal option at your next outing! What are some questionable ingredients you have spotted in “healthy” convenience foods? This post is sponsored by Molly’s Suds: 100% free of parabens and harsh chemicals. Their products are safe for even your tiniest family members! Get 20% off with the coupon code “KOTH20” and try them out today! Time Saving Tips to Getting Real Food On the Table... Fast! Next Post: The surprising things you learn when escaping the mundane (hint: it isn’t as mundane as you think). Great post, I agree it’s so hard to find good food when on the go. Usually if we haven’t packed our own snacks or run out we will stop at a grocery store and get things we know we can eat. I’ve seen many foods labeled as “healthy” or gluten free that are so full of ingredients I can’t pronounce. We generally stick to veggies, or hard boiled eggs for an on the go snack. We avoid fast food all together, unless it’s for a drive through water on a hot day when we run out. Hi Michele. Great article. I usually buy organic full-fat greek yogurt and blend in my own fruit (and a little unprocessed honey as needed.) But one day, I decided to see what the same company’s honey greek yogurt had in it. You’d think it would be honey, right? No, actually there was no honey in it at all. Just “honey flavored sugar”. And that’s an organic brand. Not the typical yogurt makers. So, I think it is important to check the labels of everything we buy in the store. But it gets really hard to eat out these days and eat whole foods at the same time. The choices for healthy whole foods on the menus of most restaurants gets pretty limited. Michele it’s great post. Wonderful article over healthy food. Nice tips how to choose healthy foods. Article is also telling us which foods are good for us and which foods are not good for health. A nutritious and healthy food is very necessary for us but it is difficult for us when we go for travel or on tour. Therefore we should be very careful to choosing right diet and healthy foods. I’m always amazed at the deception the food industry throws our way. Foods labelled as “healthy” that really aren’t is one of the most frustrating things about the industry. Even at some so-called health food stores I have a seriously difficult time finding snack foods that don’t have added sugar or even different types of oils (soybean, corn, etc.). This is a great post, thanks for pointing out what to look for! It’s not even just all the sugar, fat, and salt they inject into it, though! The food is often processed to a point where there isn’t any nutritional value whatsoever. Anyway, we often get the question about what to eat when you’re on the go, and usually our advice is just to prepare snacks to go that you can throw in your purse because there really isn’t that much healthy food out there when you’re in a hurry.